For those who prize accessibility, affordability and authenticity, Fairburn is a very sweet situation. Here, you can really go places. You can have the world, while holding fast to a unique place that's a wonderful little world unto itself. Depending on what you need or want on any given day, the whole bustling, 24/7 world is within your reach, yet you can inhabit a calm haven, a welcoming refuge, a place where neighbors invite you over to sip summer lemonade under the shade trees, the kind of place you thought didn't exist anymore, your own little town. It's a feeling Fairburn leadership has worked hard to preserve even as the town has grown. It's a sensibility Fairburn residents cherish, and one that can only truly be understood once you're situated here. If you missed the State of the City Address presented by Mayor Elizabeth Carr-Hurst. Click here to view her speech. 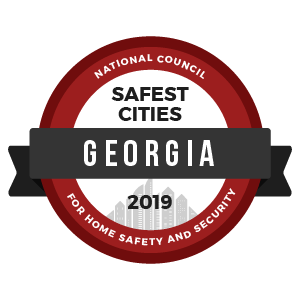 Fairburn listed as one of the Safest Cities in Georgia 2019. Read to learn more about the Levelized Billing Program; a payment method that eliminates large seasonal fluctuations in your monthly utility bill. Did you know the City of Fairburn is a participating member of the Operation Save A Life program? Contact the Fairburn Fire Department at (770) 964-2244 for a free smoke detector for your home! Fairburn Property Tax Bills for 2018 have been posted. Click below to view and pay online. Fairburn is one of six communities selected to receive assistance with its housing needs through the Georgia Initiative for Community Housing (GICH). The City of Fairburn is proud to announce that it has joined the Georgia Main Street Program as an Affiliate. The program, which follows the National Main Street Center's™ approach to downtown revitalization, is a tried and true management strategy helping activate volunteers in breathing life into main streets across America. You are invited to view the 2019 State of the City Address with Mayor Elizabeth Carr-Hurst.